Also our own bloggers of webtexttool have a hard time blogging sometimes. The search engine optimization is quite easy with webtexttool, but there are a lot more things to do than just optimizing your content. We already wrote some articles about writing to reach your target audience, steps to improve your written webcontent and how to conquer a writers block, but we always want to keep getting better in what we do. That’s why we decided to search for the most useful tips from bloggers for bloggers. And of course we’d love to share this new knowledge with you. In this blog you’ll find a summary of the hundreds of blogger tips to be found on the Internet, with the best tips according to us. Getting a successful blog is always a combination of perseverance and motivation. It’s very important that, if you start your own blog, you won’t stop writing if you don’t get hundreds of views on your posts. Every success has a beginning and even the most famous and popular blogger had to start with just writing for their friends and family. So keep motivated and fight for your spot in the bloggers world. Blogger tip #2 – Go outside! If you don’t have any inspiration, it can be hard to stay motivated. Some bloggers have the opinion that you shouldn’t write if you can’t think of something to write about, but that sounds like giving up. And, giving up isn’t something that you should do. We wrote an article about how to conquer your writer’s block but also on the internet we found a lot of useful tips. The best tip is to go outside and let the inspiration come to you. Go to the supermarket; get on the bus to a place you’ve never been or do something crazy. The most boring and unexpected situations can give you all the inspiration you need. Make sure you have a little pen and notblock with you, if you find what you’re looking for. Or make notes on your mobile phone. We think that a good proportion of pictures and content is very important. We, as humans, like to see a lot of figures, pictures and images to visualize the things we read and hear. That’s also something you should use in your blog. Make sure that you amplify your content with relevant visual content but even more important is to find the right proportion of both. Adding too much pictures because you’ve got too little information doesn’t work either, so think about the right amount of visuals to support your blog the best way you can! To get a lot of views on your blog, it’s also important to think about structure and usability of your website. When people end up at your site after a Google search, they decide in just a few second whether they will stay or not. They will check fast if your blog is useful to them or not. So make your blogs easy to read. If you have a lot of content without any structure, it might be hard to read for visitors and this may scare them away. Add some structure and increase the usability of your blog for the best results. It’s not that hard and it’s totally worth it. Structure your content. Use headlines, bold and italic tags and paragraphs to increase readability. Keep your layout clear and clean to increase usability. Start your article with a good summary of what your article is about. Make sure they can navigate to other pages on your blog in just one click. One of the most important things to think of when you’re writing your blog is: ‘how you want your target audience to connect with you?’ To support this connection it’s important that your blog is authentic and recognizable. If you’re blogging about your personal experiences, why don’t you add some pictures of yourself? Is your favourite colour orange? Make sure it comes back in every post of yours. Unity makes that your blog becomes recognizable and that people know what they’re dealing with. Your unique style makes you authentic. And that’s what people love in a blog. So don’t be shy and share your personality in your writing and design. 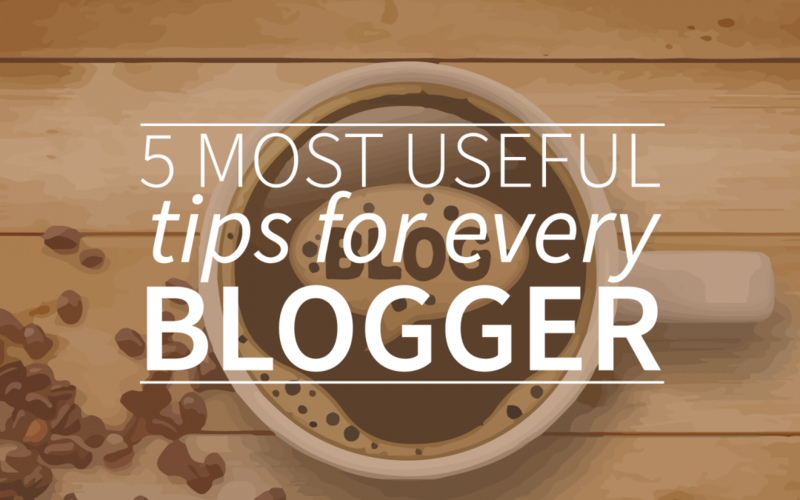 There are a lot more tips and tricks about blogging but these 5 blogger tips are the most important ones according to us! Do you have some tips of your own? Please share them with us on twitter @webtexttool! If you want to know more about how to opimize your blog technically, you should start your free trial of webtexttool today!